The health benefits of Antioxidants are an increasingly popular nutrition topic. The health promoting benefits of including natural antioxidants in your diet have been widely publicized in magazines, television, books and newspapers. This is an especially emotionally charged topic when well-known health gurus or celebrities make claims about them in relation to natural cures for cancer and cancer prevention and of course antioxidant antiaging. However many people are still oblivious to what antioxidants actually do within the body and why these chemical processes are so important. So what are antioxidants and why are the benefits of antioxidants the new “in thing”? As the name suggests, antioxidants inhibit the oxidization of molecules in the body. When molecules oxidize, a cellular bi-product known technically as a “free radical” is produced. Free radicals are unstable, and as they seek to become stable they attack healthy cells. This contributes to the degeneration of cells, and is, at a basic level, what causes the aging process. Free radicals and their negative effects on other cells have also been shown to be a significant contributing factor in the development of all manner of diseases, including cancers, heart disease, diabetes and even Alzheimer’s. Antioxidants curb the oxidization of molecules, and therefore seriously limit the production of free radicals. They can also help cleanse the body of free radicals. Before the days of intensive farming and heavily processed foods, most people ate a diet rich in whole foods. This kept the body well stocked in antioxidants and helped protect against free radical activity. Many nutritional therapists and health gurus claim this is the reason that cancer was so much less prevalent “back in the old days”. 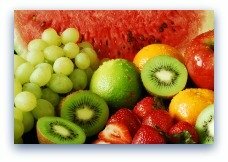 This is why it is universally accepted that the human diet needs to contain plenty of fresh fruit and vegetables, which are generally speaking very rich in antioxidants, to keep the body in optimum condition. The health benefits of a diet rich in antioxidants are huge. Not only do they provide a natural protection against all sorts of diseases by impairing the breakdown of healthy cells, but they also help fight visible and non-visible signs of aging. Free radicals can damage any cells in your body, from your brain and other vital organs to bones and even hair and nails. This means that adopting an antioxidant rich diet and lifestyle will benefit not only your overall health, but also how you look, and even, to some extent, how well your memory works, your eyesight and the strength of your bones. Antioxidants’ anti-aging properties affect every cell, from those you can see to those you can’t. Here is a list of some of the reported health benefits by people who supplement their diets with antioxidant rich foods or take a nutritional supplement. Increased energy is the most commonly reported benefit. Improved digestion - this is especially noticable when diets overloaded with processed foods or take-out are revamped and fiber and water intake is increased. Improved immunity - by taking extra vitamin C, many people report that they don't catch as many flus or colds and if they do then the symptoms are less severe and they recover faster. Improved memory - blueberries have shown in studies to possibly be beneficial with age related memory problems. Incorporating antioxidants into your diet at sufficient levels to see these benefits is incredibly simple. You just need to ensure you eat a balanced diet with a wide variety of antioxidant rich fruit and vegetables included. It is also helpful to try and avoid things that promote the production of free radicals as well, such as smoking, over exposure to the sun, and over use of prescription or over the counter medicines. Some foods are so rich in antioxidants that they have earned the name “superfoods”. These include most berries, nuts and seeds, garlic, chilies, tea and most brightly colored or dark green fruits and vegetables. Research has shown that where these foods are consumed regularly, for example in Mediterranean countries where the diet is rich in olive oil, people enjoy a greater life expectancy and a much lower incidence of heart disease, stroke, certain cancers and other serious illnesses. Ensuring that you are getting some of these superfoods (and as much variety as possible) on a daily basis is one of the easiest and most effective ways to care for every part of your body. You can also invest in antioxidant anti-aging products to apply to your skin and hair, which can, as a supplement to an antioxidant rich diet, help reduce and repair the damage caused by free radicals at a topical level. By consuming plenty of antioxidants and avoiding where possible things that leave behind a toxic residue in your body, you are taking very positive preventative steps when it comes to most degenerative diseases and the effects of aging. Take the information from these health articles and start making small changes to your life. You'll see and feel the difference.